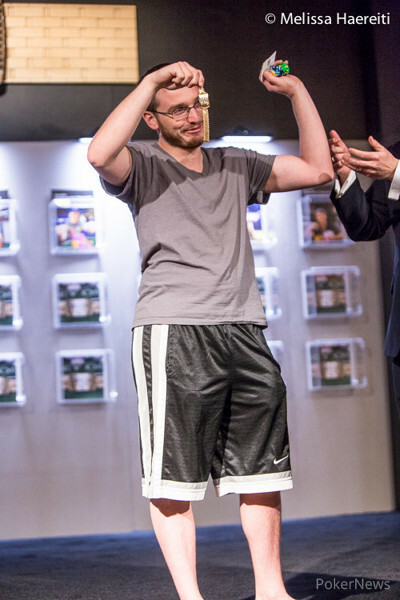 Hand #120: Andrew Lichtenberger raised to 160,000 on the button, Kevin Eyster reraised to 360,000 out of the big blind, and Lichtenberger tank-called. 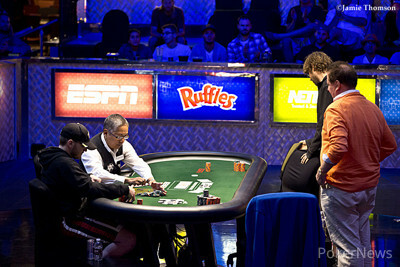 The flop came down , Eyster led out for 300,000, and Lichtenberger tanked for well over a minute before calling. The turn was the , and Eyster quickly checked. Lichtenberger checked behind. The river was the , Eyster instantly moved all in for effectively 620,000 - a pot-sized bet - and Lichtenberger returned to the tank. He sat back in his chair, resting his head on his hand as he riffled chips with the other and studied both the board and Eyster. For the better part of three minutes, the only sound you could here in the Mothership was Lichtenberger's chips going up and down. Up and down. Up and down. Finally, he called, and Eyster showed for queens and tens. Lichtenberger was forced to reveal for effectively ace-high, and his rail gave him a nice round of applause as he walked away from the final table area.